Recently WFTV in Orlando, Florida reported on a story involving the Orlando Women’s Center, an abortion center, and Dr. James Pendergraft, their lead physician. In this article it is reported that Pendergraft has lost his medical license on five separate occasions for a variety of behaviors related to the work done at the Orlando Women’s Center. One of those situations is reported to have involved performing an illegal third-trimester abortion as well as reports of other botched abortions. Pendergraft reported to WFTV that he is in the process of again regaining his medical license. When Pendergraft was asked by a WFTV reporter whether he would trust a doctor who had lost his medical license five times he replied, “When you look at why I lost my license, it had nothing to do with anything I did wrong”. However, the State of Florida disagrees. So do the courts that imposed a $36 million dollar malpractice judgment against him. Yet, in spite of not having a valid medical license, Pendergraft says that his clinic is again reopening with six other physicians doing the work. 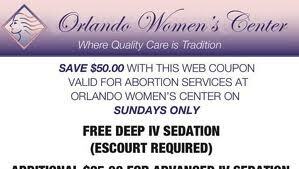 If you visit the web site for the Orlando Women’s Center you will see that the center is now giving a coupon for $50 off for a Sunday abortion. That’s right, our culture now gives coupons for abortion. We treat a life like an oil change…here take this coupon and take a life. I’m tired of hearing the woman’s choice debate. The driving force behind much of the abortion issue today is big business. Abortion centers don’t care about freedom of choice; they want the money. 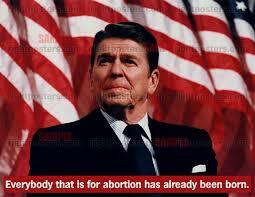 As followers of Christ what should we remember about the abortion issue? First, we should want every life to be valued and cherished. After all, in the first chapter of Jeremiah, God tells Jeremiah this, “I knew you before I formed you in your mother’s womb. Before you were born I set you apart and appointed you as my prophet to the nations.” You see, God already has plans for folks while they are in the womb. Second, it’s time to realize what a dirty business the abortion industry really is and remember that abortions rob our world of the precious gift of life. Develop some discernment on the abortion issue and understand that this business cares far more about the money in these women’s wallets than the babies in their mother’s wombs. Fourth Trimester Abortion: Are You Serious? Today I want to talk with you about fourth trimester abortions. I hope you are already asking yourself what this means. The term itself makes no sense. By definition a trimester has three parts, not four. Dan Joseph, in this video, explained that his made up term of “fourth trimester abortion” would allow the killing of an infant after birth. Dan visited the campus of George Mason University armed with his fictitious petition seeking signatures to support fourth trimester abortions. Within one hour Dan obtained fourteen signatures on his petition. Dan went to George Mason armed with his petition and gave the usual pro-choice rhetoric as students passed by. Few students asked about the definition of a fourth trimester abortion and many simply signed the petition. One student asked if this procedure would harm the baby. After learning that it would she signed anyway. Frankly, I don’t know what part of the definition of abortion she didn’t understand. Abortion ends a pregnancy and ends a life. Why would you even ask if this harms the baby? A second student is told not to even read the petition just to sign it and without any consideration for the content of the petition signs his name. Second, don’t put a lot of credibility in petitions. People will sign almost anything. Next time you hear about a petition with 100,000 names on it just remember these fourteen clueless folks who supported fourth trimester abortions. Wisdom is calling to each of us. It’s time to start listening.